The reverse with a pseudo Chinese mark. No other example quite like this is recorded. 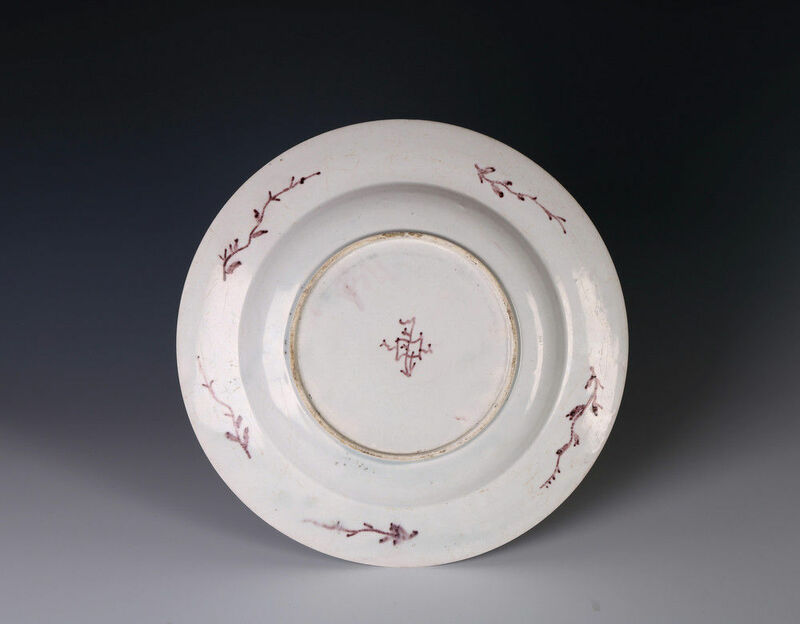 Decoration in underglaze manganese is extremely rare on porcelain but was attempted experimentally at Chelsea, Worcester and Liverpool in their early years. Manganese is one of the few colours that can withstand an underglaze firing but never proved as successful as underglaze cobalt blue; this was partly for aesthetic reason but perhaps it was also technically harder to control. 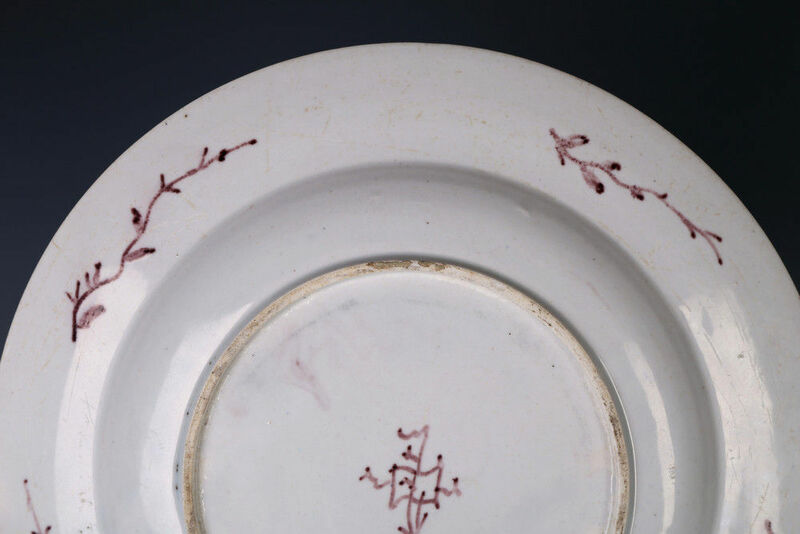 The porcelain appears to be steatitic and the decoration of finely outlined flowers issuing from rockwork in a Chinese style is characteristic of the hand of a delft painter and so suggests a porcelain centre that also produced delftware. 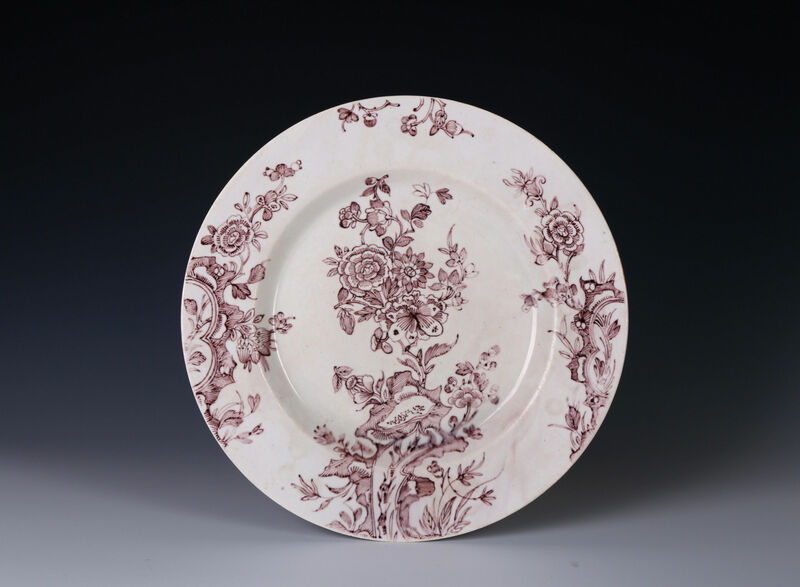 The porcelain itself has a slight brownish translucency and might be slightly underfired. An attribution to a Liverpool factory is a possibility, perhaps to that of Richard Chaffers or Samuel Gilbody. A small bowl painted in manganese with the ‘Dragon pattern’ attributed to Samuel Gilbody’s factory is illustrated by Bernard Watney, Liverpool Porcelain, 1997, p.59, fig.227. Another possibility is Vauxhall; the shape is consistent with this attribution as is the translucency, Vauxhall also employed delft painters.